Choosing a CB radio that perfectly suits your needs can be a challenging task but don’t worry because we’re here to help. With that in mind, we have compiled a list of the best 10 meter CB radios money can buy right now. Each of these radios will impress you with their superb performances, as well as their quality and durability. Buying one of the best 10 meter CB radios means that you won’t have to get another one in years. Finally, these radios are also pretty affordable, especially considering what you’re getting in return. So, without further ado, our top picks are as follows! The AnyTone AT-5555N can be considered either a HAM radio or a CB radio depending on where you live in the world. Different countries have different regulations when it comes to radios so you’ll need to keep that in mind if you’re looking into this specific model. The AnyTone AT-5555N can be used as a CB radio without any problem in a large number of countries. Unfortunately, those countries don’t include the United States. In the US, this model is considered a HAM radio and cannot be used to transmit on CB frequencies. That said, you can still use it to listen to said frequencies. The AnyTone AT-5555N is primarily meant for HAM radio operators who hold the proper license issued by the FCC. If you are among those, expect to benefit from more features than similar models, as well as more channels. This type of radio operates within frequencies ranging from 28.000 to 29.700 MHz, better known as the 10-meter band. Amateur (HAM) radio generally operates within this band, at least in the US. The AT-5555N can be turned into a CB radio that accesses frequencies between 25.615 and 30.105 MHz. If you’re not sure how to do this just send us an email and we’ll help you out. Bottom line: AnyTone AT-5555N is one of the best HAM radios you can find, but can easily be turned into a CB radio if you want it to. As buying AnyTone AT-5555N means getting a 2-in-1 product, it means that its price is far from being high. Featuring excellent receiving and transmitting capabilities, the Stryker SR-655HPC is one of the most reliable radios currently available. Not only that, but this is also a rare example of an excellent product that will not break your bank. The Stryker SR-655HPC can be considered a very affordable radio when taking into account the large variety of features it brings to the table. Perhaps unsurprisingly, the great value proposition turned the radio into one of the most popular options currently available. Among the most noteworthy features, we find four powerful FQP13N10 MOSFET transistors capable of generating 70+ watts PEP. This allows the user to achieve transmissions of unparalleled quality. Stryker SR-655HPC was built with reliability in mind and it shows. Definitely worth looking into if you’re the type of person who greatly values performance. Bottom line: Despite being one of the cheapest CB radios you can find, Stryker SR-655HPC also provides a high level of performance. 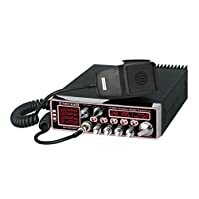 It’s also very reliable and, according to users’ reviews, Stryker SR-655HPC is a very durable CB radio. Connex produces a wide variety of radios but the 4400 Turbo is undoubtedly one of the company’s best products so far. Not only is it an extremely powerful device, it’s also very easy to use. This makes it a favorite both among the newbies and the experienced CB radio operators. 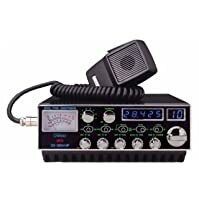 If you’re looking to purchase this radio for the purposes of transmitting it’s worth noting that you are going to need to acquire a license. Bear in mind that purchasing radios and listening to transmissions is perfectly legal in the US, but you need to be approved by the FCC if you want to transmit. 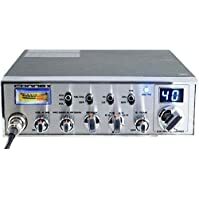 Bottom line: If you’re looking for a powerful CB radio that will serve you well for years, look no further than Connex 4400. Galaxy is a very respectable manufacturer of radios that never ceases to amaze us with their products. The Galaxy DX-33HP2 is a prime example of this thanks to its numerous features and ease of use. This particular model includes a single knob for the echo controls and a front-facing microphone jack. In addition, you’ve also got buttons that control light intensity and talkback, which can easily be turned on or off. Convenience is the name of the game here and the Galaxy DX-33HP2 offers it in spades. With this radio, there are few controls to keep track off, which makes it ideal for novice operators. The Galaxy DX-33HP2 is a great choice for truck drivers and its compact size means that you can fit it in pretty much anywhere. Also ideal for anyone who drives a lot during the night thanks to the adjustable light controls. Bottom line: This is a small and compact CB radio, which can provide impressive performances. It’s also very easy to use, not to mention that it’s made by a reputable company, known for manufacturing super-durable products. If high power output is what you’re looking for, you are definitely not going to be disappointed by the Galaxy DX98VHP. This baby can dish out a whopping 200 watts of modulation, which is 50 watts more than the Galaxy DX95T2. If you’re worried about the radio getting too hot due to the high output we can guarantee that this is not the case. The manufacturer considered this important aspect beforehand and equipped the Galaxy DX98VHP with two fans designed to optimize airflow and stabilize the temperature. Are you in the habit of driving a lot during the night? Well, that’s not a problem with this radio because the StarLite faceplate and MOD lamp make it ideal to use during the dark hours of the night. Looking for a radio that can be personalized to fit your specific needs? If that’s the case, you’re definitely looking in the right place because the Galaxy DX98VHP lets you adjust pretty much everything to your liking. One of the best things about this radio is that all of the most important controls can be adjusted with ease. This includes the output power, RF gain, talkback, and light intensity. Bottom line: In our opinion, Galaxy DX98VHP has all the features needed to be considered one of the best 10 meter CB radios ever. Even its price isn’t too high, which is another reason why this radio gets our recommendation. The Stryker SR-955HPC is also a very well-designed product with a unique look that easily allows it to stand out from the crowd. If you want to learn more about Stryker SR-955HPC CB radio? 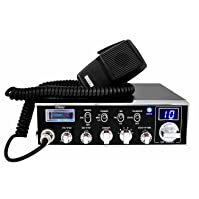 Just read our Stryker SR-955HPC review 2019 here to find out if this CB radio is what you were looking for. As you can see, there are definitely more than a few good radios to choose from. The real question is: what are the features that would be the most useful to you? While the Galaxy DX98VHP offers great power output and a large suite of features, models like the Galaxy DX-33HP2 and Connex 4400 Turbo are easier to use by beginners. Meanwhile, you’ll probably want to go with the Stryker SR-655. 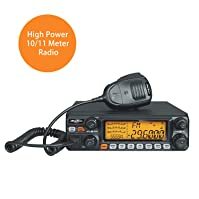 If you’re looking for a radio that offers great bang for the buck. Finally, the AnyTone AT-5555N may require a bit of tweaking on your part but it can easily be turned into one of the best 10 meter CB radios out there if you know what you’re doing. You Galaxy n Connex. Are the same radio. Come off the same assembly line. Just _ different faceplate.